The stunning silhouette of this leotard is synonymous with the image of a ballerina, and it’s a must-have piece to wear alone or incorporate into dance outfits. A variation of the open back found on most camisole leotards, its no-slip back straps allow unlimited movement. Child Large and Adult sizes include a front shelf lining for added support. 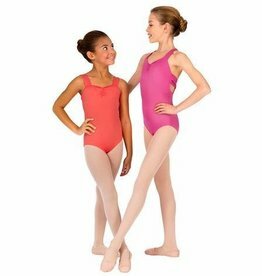 This standout halter leotard by Motionwear features empire seaming, a double layer halter neckline, and a ballet cut leg line. A pinch front skinny strap halter is layered under a plunging wide strap halter for a very flattering effect.